Everyone is selling their cars on the internet these days. If you want to make your particular vehicle stand out from the crowd, you have to tap into a heretofore untouched font of creativity: show off some condoms as a decorative touch. Y’know, just to let everyone know this car well and truly fucks. This sprung up on a Facebook Marketplace ad for a 1985 Chevrolet K10 in Littleton, Colorado published yesterday. At first glance, it looks like a pretty standard listing: It shows mileage, price, photos, and a quick description of why the seller is getting rid of the truck. 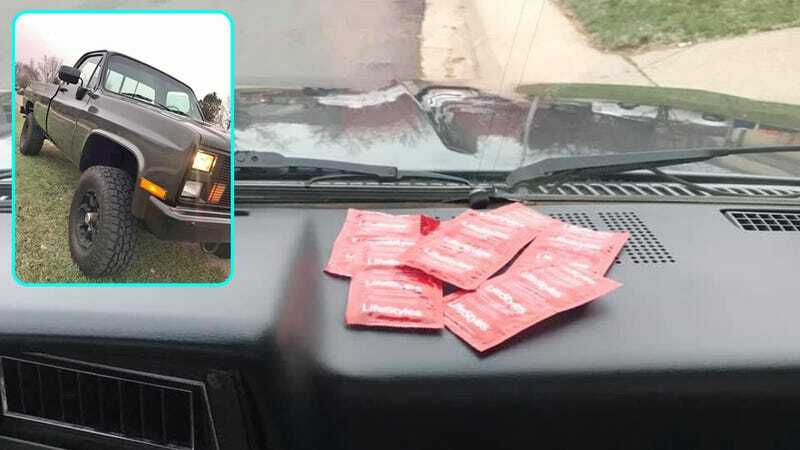 I can’t quite tell you what there is to gain by sticking a bunch of condoms on the dashboard. Is this some kind of subtle flex? A size comparison? A free gift? An assurance that there will be no unseemly stains in the interior? Or is it just a creative way to let everyone looking at this ad to know that your car, above all cars, fucks?